Creating more engaging content throughout 2017 is the top priority for 73% of B2C content creators. Is effective visual marketing at the top of your priority list? This year has been the year of visual marketing for me, and I have spent more time, money and effort creating a variation of visuals and videos as well as live streams. Going through this process has enabled me to also create two brand new, and certified image marketing courses, as well as a visual marketing webinar, which I will be giving to you free of charge at the end of this article. But first, I wanted to share with you the research I found when looking at inspirational brands using visual marketing effectively. Whilst these are global brands, apply the way they have visually displayed their marketing, and think about how you can do the same. Using a tool like Canva will provide you with everything you need to create a professional image, at a very small cost. Here are 7 brands using visual marketing the RIGHT way. In 2016, TOMS’ campaign was designed to raise awareness of the cost of shoes, and how this affects a child’s life such as not being able to go to school. The idea behind the campaign was for people to use the hashtag #withoutshoes on a specific day, and TOMS would donate a pair of shoes to a child in need. They ended up donating 27,000 pairs of shoes to children in 10 different countries. Whilst the concept of this campaign was based around charity, they also backed this up with simple, clean and striking imagery. AirBnB have created an interactive real-time visual representation of where all of their guests are staying. I wanted to include this in the list because this is an innovative, and great way for a brand to connect with their current customers, and potential customers. They have also taken what would have been a boring piece of information, and made it interesting for their audience. 3. Is A Barbie Body Possible? An infographic was created for a post on a Rehabs.com to show the difference between Barbie’s body statistics compared to the average American woman. This was created to help prevent eating disorders in young women/girls. This infographic has been shared to more than 200 websites, and individually shared more than 55,000 times. The message was important, and the use of an Infographic to showcase the statistics is what turned this campaign into a shareable piece of effective visual marketing. Does the below visual look similar to something you have already seen? Someecards has been around for a very long time, and their visuals are shared thousands of times over, and over again. Their business model is simple. You can create an eCard completely free of charge, and share it online. It is a satirical approach to an ordinary card, and they are funded primarily from ads. Someecards have taken humour and relatability to create an amazing visual marketing experience, and one that in truth; sells itself. Dutch Airline KLM’s Lost & Found video has generated 22 million views, and has made it onto the list for two different reasons. The first being that they used a video. By 2017, video content will represent 74% of all internet traffic and 4x as many consumers would prefer to watch a video over any other kind of content. The second reason it made it onto the list is because of how they use emotion as a trigger to increase engagement. Have a watch of the video below, and you will understand why it has been a successful piece of visual marketing. Turning heads with the visual below, is definitely one way to get over 35,000 job applications. This genius idea of filling a job position was created by Queensland Tourist Body. They used a captivating visual to encourage people to apply for their job vacancy. Not only did they have 35,000 job applications, but they also amassed 7 million website visits. As mentioned above, video is an amazing way to engage with your audience online but you can take it one step further, and venture into Live Streaming. 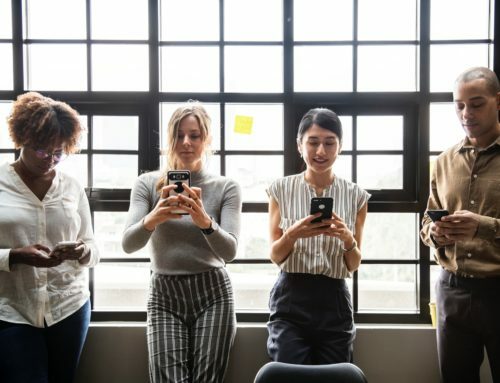 Experian runs a weekly live chat on Twitter, YouTube and Periscope using the hashtag #CreditChat to engage with their audience and educate them about finance topics. They then turn these Live Streams and turn them into Podcasts that can be viewed at a later date. I hope that the above 7 brands using visual marketing effectively will inspire you to do the same! So, you have visual marketing inspirations, what’s next? How are you going to utilise your images to increase engagement by up to 150%? I have a recorded live webinar, which is CPD CERTIFIED and will help you understand how-to use visual content used on your website and through your social networks to increase brand awareness, generate leads and boosts your sales!